View and edit item details in the Items Table, in the item card, and in a Timeline or Swimlane. You can edit an item's individual field values directly in the Items Table. But if you want to view or edit everything associated with a roadmap item in one go, the item card is the better choice. You can open the item card from any of the roadmap's Timelines or Swimlanes as well as from the Items Table. Other than Description, you can edit any field directly in the Items Table. 1. Mouse over the Items field and click the Edit icon. 2. Edit the text as needed. 3. Click out of the field to save your changes. TIP: To edit the item's Description field, click the Items field to open the item card (see Viewing and editing item details in the item card further on in the article). 1. Click the item's Date to open the date picker. 2. 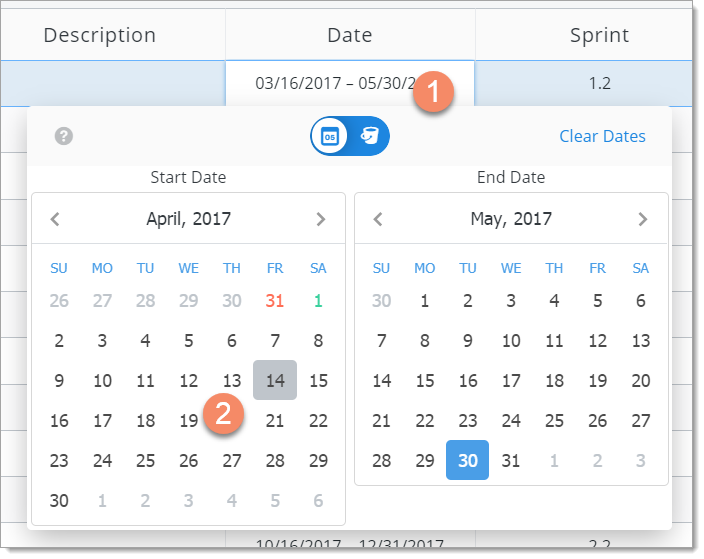 In the date picker, select a new Start Date and/or End Date. If you want a specific date instead of a date range, select the same date for both. TIP: If the item's Date is a time Bucket, change the value like you would for any List field. 1. Click in the item's field in the table. 2. In the field dropdown, select the new value. 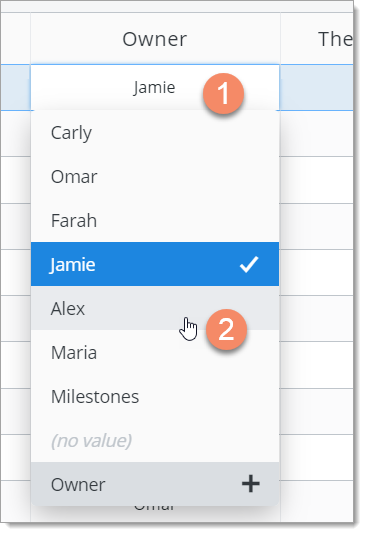 TIP: If you're editing a Multi-select List field, where you can select more than one value, you can edit the field by adding and/or removing one or more values. 1. Click inside the field in the table and make your edits. 2. When you're done, click anywhere outside the field. If you want to change a field in more than one item to the same value (for example, change Status to Backlog), you can do a bulk edit. 1. Select the items you want to edit in the table's first column. TIP: A checkmark in the column indicates the item is selected. To unselect an item, click its checkmark. To unselect all items, click Clear All at the top of the column. 2. Click the field you want to edit in any of the selected items. 3. In the field dropdown, select the new value. You can open an item card from any of the roadmap's Timelines or Swimlanes as well as from the Items Table. Click the item's Items field. Click the item on the Timeline or Swimlane. What can you do in the item card? The item card is like command central for items, where you can view and edit everything associated with an item. Edit the item's default fields: Item/Name/Title, Date, and Description. You can also delete the item by clicking the Garbage can icon. WARNING: Do NOT delete an item before reading Delete items. The Activity tab displays the item's Activity Feed. The Activity Feed is a log of all the changes made to an item since it was created, including posted comments and mentions. To learn more, go to Post comments and mentions to an item. The Fields tab lets you view and edit the item's custom fields (more about this below). 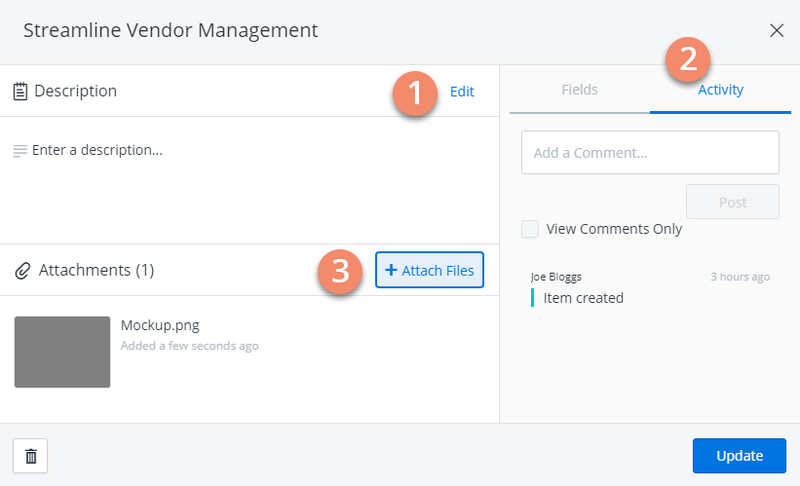 Upload, view, download, and delete file attachments. To learn more, go to Add, download and delete item attachments. Click inside the field and enter the new value. Change the item's Date in the date picker (see Editing items in the Items Table above). Click inside the field and start typing. You can use Markdown in the description. Click the ... icon below the textbox to get help on Markdown syntax. You can edit all the item's custom fields in the Fields tab, including List, Multi-select List, and Free-form Text fields. 1. Click Fields to open the Fields tab. 2. To edit a List field, click to open the field's dropdown and select a new value. If it's a Multi-select List field, edit the field by adding and/or removing one or more values. 3. To edit a Free-form Text field, click inside the field and start typing. You can edit an item's details directly in a Timeline or Swimlane (to add an item to a Timeline or Swimlane, see Create roadmap items). To change an item's Start and End Dates directly in a Timeline, drag the item horizontally along its stream until you see the new date range. If you need to edit an item's field values, you don't need to go back to the Items Table. Just drag-and-drop the item vertically and/or horizontally across the pivot headers. 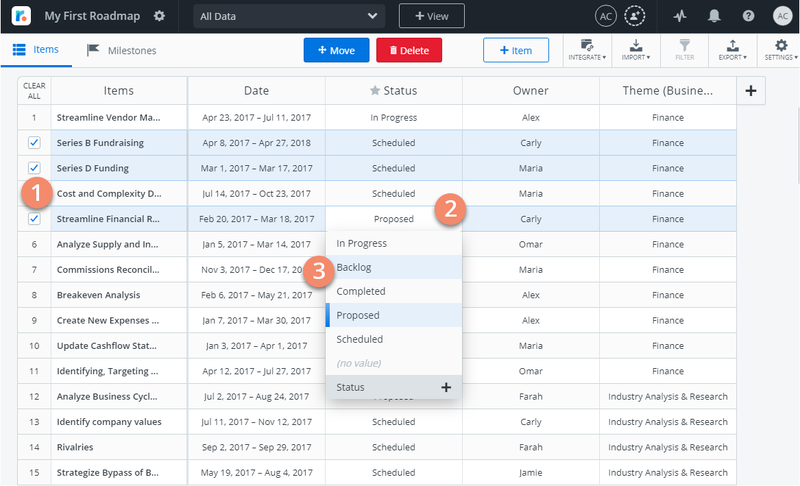 The item's pivot field values are automatically updated based on the item's new location in the Timeline or Swimlane. To lock an item's date on a Timeline as you drag it vertically, press and hold the Shift key. Other items will move out of the and new streams will be added if necessary. To move a stream on a Timeline, click and drag the stream up or down to its new location. Other streams will move out of the way as needed. To add a new stream, drag an item up or down and drop it onto the newly created stream. You can also add a new item and drag it to the bottom of any header row, then drag the new stream to where you want it in the Timeline. Who can edit items in a roadmap? 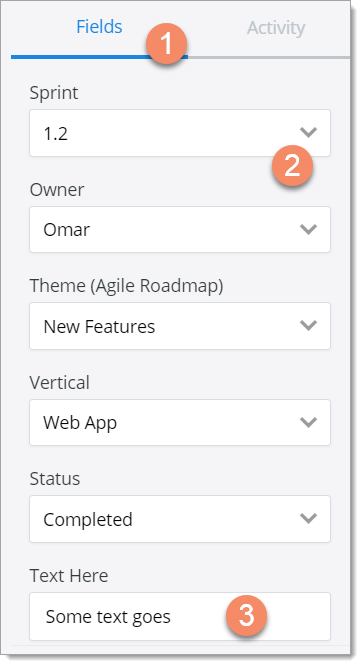 To edit items in a Roadmunk roadmap you must be the roadmap's Owner or the roadmap must be shared with you as an Editor. If a roadmap has been shared with you as Viewer, you have view-only access to the roadmap. This means you can view items in the Items Table and all roadmap Timelines and Swimlanes, and view item details in the item card (View items in the Items Table). You can also post item comments and mentions in the item card (Post item comments and mentions).